OK enough with the rain for a minute! Thirteen inches over the last few weeks but at least the forecast for the next week looks sublime and maybe fall is really here. We had a great time in Portland last week with the cut flower growers where they kept us on the move. Up every morning at 5:00 to get on a bus for another tour. 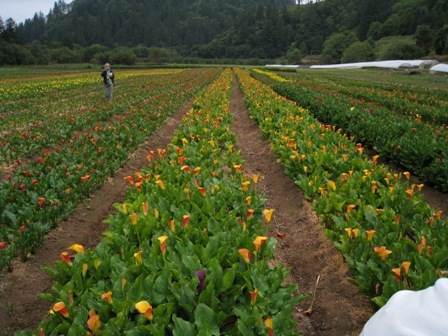 The first day we went out to the misty coast and saw acres of colored calla lilies, hydrangeas and the largest artichoke producer in Oregon, beautiful huge purple chokes. The second day we went to the Portland Wholesale Flower Market for a short visit but it is always good to see how the larger farmers send their product through the system. In our only real free time Betsy and I made it downtown to a really great small farmers’ market (the size of the Carrboro Wednesday market) with some of the finest produce displays we have ever seen anywhere. We took lots of pictures and brought home some new ideas for our set up at market. 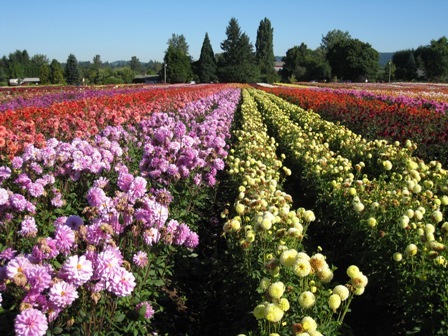 The last day we headed south of Portland into the Willamette valley to see four farms including the largest dahlia grower in the US with an amazing 40 acres in full bloom! We also visited maybe the largest producer of dried flowers in the US with something like 30 acres including their huge drying rooms and processing facilities. Just when we thought the bus rides were over we got back on the bus that evening and went up the Columbia river gorge for a dinner cruise on an old paddle wheel boat. Beautiful night on the decks with the moon rising over the river. Friday we were up again at 5:00 to start the long flight back home. Back to the farm with just enough daylight to cut some lettuce, feed the turkeys and finish loading the truck. Dan and Cov did a great job taking care of the place and had us ready for market but by the time market was over on Saturday we were ready for a rest! Things here on the farm are winding up smoothly despite the rain. Most of the irrigation is up and put away (don’t seem to really need it anymore) and the Big Tops are uncovered except the last bay with the last tomatoes. Soon we will be ready to begin to turn under all the fields. The little sliding tunnels are all cleaned out and several already planted with crops for Thanksgiving. The Brussels Sprouts are maybe the best looking we have ever grown, at least at this point. If the grass would just stop growing so fast from all the rain, the end would even be closer.